Birdland is a famous jazz club in New York City named after legendary jazz saxophonist Charlie ‘Yardbird’ Parker. When it opened in 1949, just north of West 52nd Street, it featured the who’s who of jazz including Count Basie, Dizzy Gillespie, Thelonious Monk, Miles Davis, John Coltrane, Bud Powell, Stan Getz, Lester Young, Erroll Garner, and many others. The original Birdland closed in 1965 before being reborn on the upper west side in 1986. More recently in the 1990s, Birdland was moved back to midtown Manhattan and remains a destination for jazz musicians and fans alike. 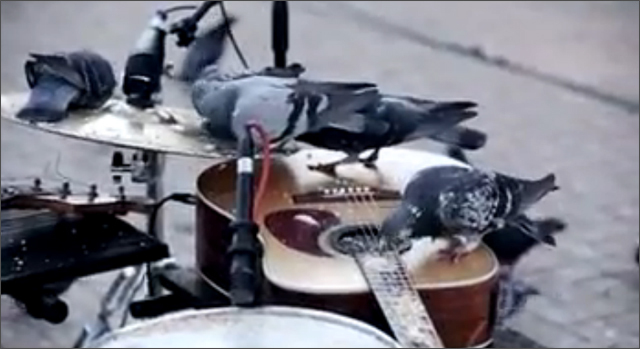 Recently a different kind of jazz/bird relationship was played out in the appropriately named Pigeon Square in Johannesburg. To promote the Standard Bank Joy of Jazz Festival 2012, a set of instruments were set up and covered with seeds and popcorns. Soon, the sweet jazz sounds of the band dubbed the ‘Featherweights’ filled the square much to the confusion and delight of passerby. I don’t envy the roadies cleaning up after this show. The stunt was created by TBWAHuntLascaris, Johannesburg and produced by Hey!Fever.